VLine Car Infotainment System - Spotify Plugin Demo. Have you ever thought that you can enjoy Spotify Radio right via your car stereo? It is now possible with GROM VLine infotainment system . You can get "CarPlay" and "Android Auto" like experience in your vehicle. You can equip your car with the modern connected car infotainment system without replacing your factory stereo. VLine connects at the back of your factory car stereo and fully integrates into your vehicle. You will use car stereo touch screen and steering wheel controls to access the music apps and navigation. You will use your voice to search for the address or music to play. Note that paid Spotify account is required to use Spotify plugin in VLine. 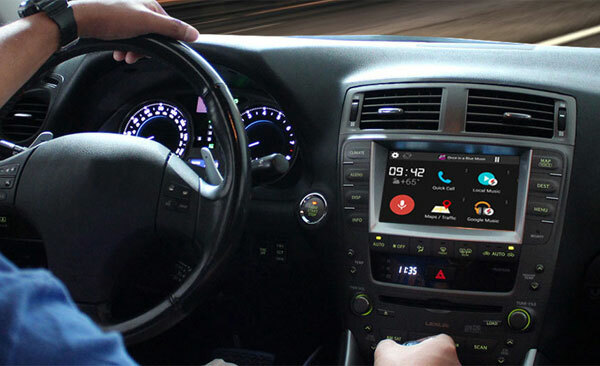 VLine is the connected car infotainment system for many factory stereos. Fully integrated into OEM car stereo, VLine provides access to the latest automotive technology: Maps (Google, Waze, others), Music Apps (Spotify, Web Radio, Google Music and etc. ), right through the factory stereo system.